After nearly five years since the Sandy Hook Permanent Memorial Commission's (SHPMC) inception, its members voted unanimously on a design selection on Monday, July 30. The commission plans to recommend their choice to the Board of Selectmen (BOS), who will ultimately be in charge of approving the decision for the town. The SHPMC consists of Newtown residents appointed by the BOS to determine the nature, location, and funding of a permanent memorial to honor the memory of the 26 people who died in the Sandy Hook Elementary School shooting on December 14, 2012. Last year, the commission selected the former SAC Field location on Riverside Road as the memorial site and proceeded to allow designers from all over the world to formally submit their ideas for what the actual memorial should be. More than 180 designs were submitted to the commission for consideration, and over the course of multiple meetings, they were narrowed down to the top three designs earlier this summer. During SHPMC's public meeting on July 17, the top three designers were invited to come to Newtown to give a formal hour-long presentation to the commission and its Advisory Panel. Town representatives from nearly a dozen groups were also encouraged to attend the presentations, as well as the families directly affected by 12/14. A question and answer portion was included at the end of each designer's presentation. There was also a time for public participation at the end of the meeting. The SHPMC's special meeting on July 30 gave each of its commission and Advisory Panel members the opportunity to give positive and negative feedback on the top three designs that were currently in the running. They started off with the design labeled SH37, which was created by Daniel Affleck and Ben Waldo of SWA Group, based out of San Francisco, Calif. Many members expressed that they were impressed with the thorough work that was put into Mr Affleck and Mr Waldo's presentation, saying it made them even more confident in their ability to bring their design to fruition. Those who previously had concerns for specific design elements said they appreciated the designers' ability to show flexibility by taking the commission's recommendations and modifying their design. "For me, I was very much relieved when I saw the revised proposal," SHPMC chairman Dan Krauss said. "I really liked it." Tricia Pinto, SHPMC member and mother of Jack Pinto, who died on 12/14, said the design was always a strong contender for her, and after hearing their presentation, it was her "first and only preference." She also relayed that out of the five 12/14 families she has been in contact with during the last week, all have told her that they would select SH37 for the permanent memorial design. Fellow SHPMC member JoAnn Bacon, mother of Charlotte Bacon, who died on 12/14, agreed, saying she not only "loved this design," but it was the only design she would want to vote forward. She added that she appreciated how "very respectful and responsive" the two designers were toward the project and the people involved. A concern that was brought up by multiple members was the life expectancy of the sycamore tree, which is an integral focal point in the memorial design. 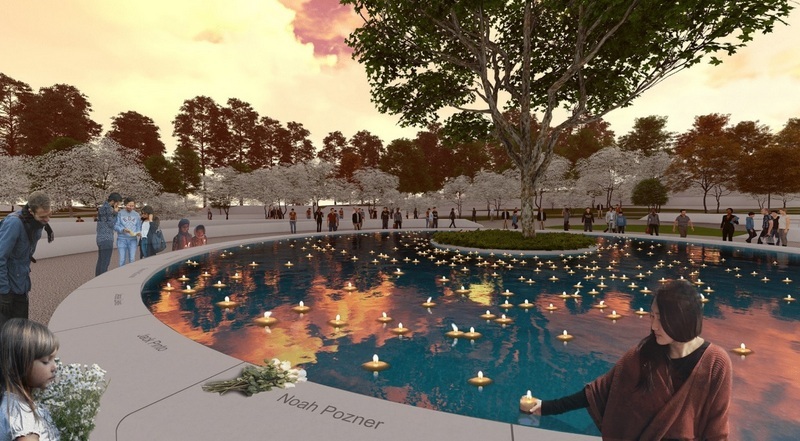 In the design renderings, it is positioned in the center of a manmade pond. SHPMC member Sarah Middeleer posed the question that with such emotional significance to the design, what happens if the sycamore tree does not thrive in the environment the designers suggest? Advisory Panel member Tom Tavella, who has more than 30 years of experience in land use planning, landscape architecture, and urban design, said the designers have his vote of confidence that the tree will not be an issue, because he believes "SWA is one of the best firms in the world." The next design the commission discussed was SH108, by landscape designer Justin Arleo of Arleo Design Studio LLC, based out of Tempe, Ariz. Many people said that despite liking the well-thought-out design, they did not think it was going to be realistic to maintain the 26 flowerbeds that played such a crucial point in the design. Commission members shared the idea that if one flowerbed did not have the same vibrancy to it as another, it could pose a problem. Another design element that was brought up as a concern was that during the presentation, Mr Arleo said that the fountains at the memorial would not be running in December - a pivotal time where gathering at the site and seeing the design elements would be needed. Also, the fact that Mr Arleo did not seek out possible connections to work prior to attending the presentation, like other designers had, was a concern for the commission members. Brian Engel, SHPMC member and father of Olivia Engel, who died on 12/14, said he liked the overall flow of the design and thought it would be a "beautiful experience," but he understood the concerns of his fellow commission members. SHPMC member and former Newtown First Selectman Pat Llodra said she has many positive things to say about the "beautiful" design, but overall thinks it would be too challenging to do. She added that if she could talk to the designer, she would want to thank him for the compassion he showed for the project and for the community. The final design to be discussed was SH240, created by RSP Dreambox Associate Principal and Experience Design Director Teri Kwant, Damon Farber Landscape Architects Principal Landscape Architect Joan MacLeod, and Svigals + Partners Associate Principal Julia McFadden. Ms Middeleer started off the conversation by acknowledging that the group's audio and visual problems hurt their presentation, but that she was still "very impressed" with the amount of work put into the project and that she could tell they had "a lot of passion" for their design. In addition, she said, "Upon reviewing all their materials and looking back at the design, I think they would have adequate resources and consultants…"
Additional positive comments included liking the birch tree grove and the overlook area of the memorial grounds. Many members, however, expressed their strong feelings against having a 27th chair included in the design elements. "Speaking as a commission member, but also as a parent," Ms Bacon prefaced, she said she felt upset by the inclusion of that element. She also expressed concerns for Ms McFadden's connection as project manager for the newly built Sandy Hook Elementary School. Another particular element that the commission discussed having a negative response to was the designers' choice of putting other people's names as a substitute for the 12/14 victims' names in the renderings of the memorial design. Advisory Panel member Allison Blais, who is the executive vice president and deputy director of strategy and advancement for the National September 11 Memorial & Museum, said she was particularly "disappointed" by the presentation of the names because they were cut and pasted from the 9/11 victims list. "It spoke volumes to me," she added. Having given each SHPMC member and Advisory Panel member in attendance the chance to speak, Ms Pinto initiated the motion to move the design labeled SH37 through. It was unanimously voted by the commission in favor of being put through. Mr Krauss told the members he would be sending out a letter congratulating Mr Affleck and Mr Waldo of SWA Group and would be requesting they send their cost estimates for the design. Mr Krauss said he will also notify the other designers that their design had not been chosen to move forward. In preparation for the BOS meeting on Friday, August 9, the next public SHPMC meeting is scheduled to take place Thursday, August 8, at 7 pm, in the Council Chamber of Newtown Municipal Center. 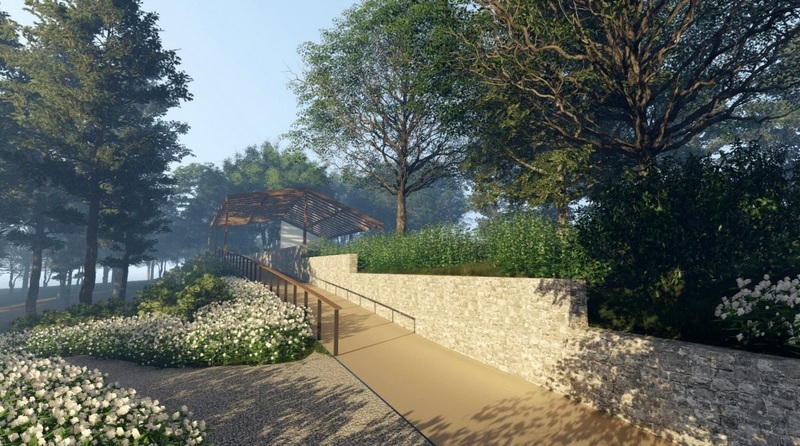 For more information about the Sandy Hook Permanent Memorial Commission and to view the selected the design, visit newtown-ct.gov/sandy-hook-permanent-memorial-commission.